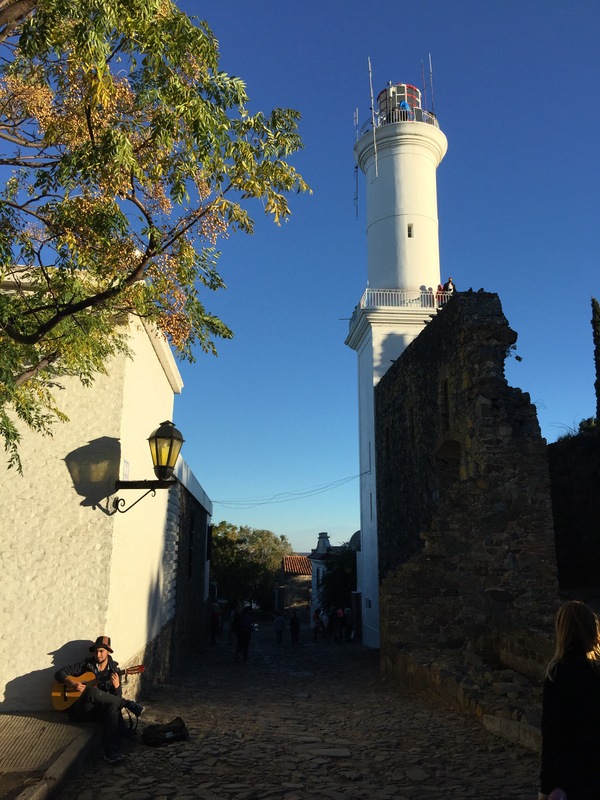 Uruguay is just across from Buenos Aires by short ferry ride. It seemed silly not to tick off another country, being so close; a few weeks back we booked the ferry across, lucky we did as it was rammed. The ferry terminal was centrally located in Buenos Aires and once checking and clearing immigration (both Argentinian and Uruguayan officers sit next to each other and stamp you out and in simultaneously) we had a short wait for the ferry. 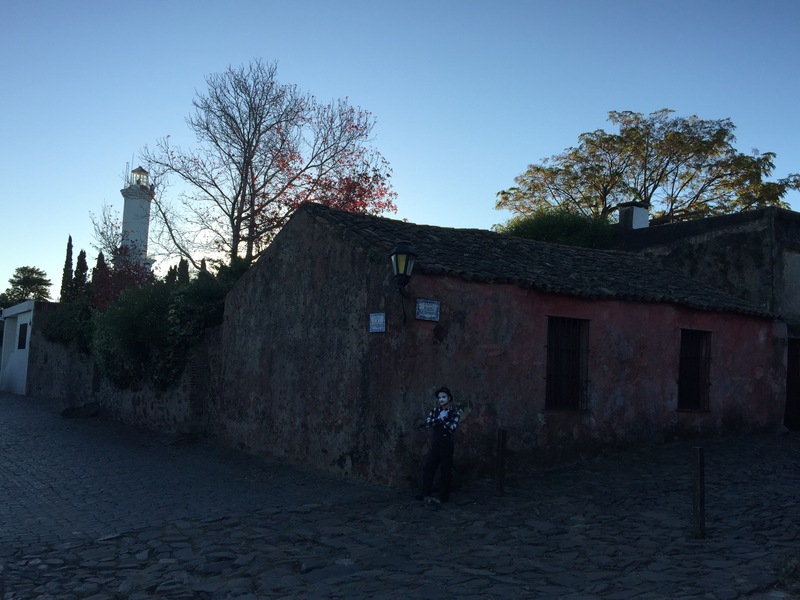 After 2 hours we arrived in Colonia del Sacramento. 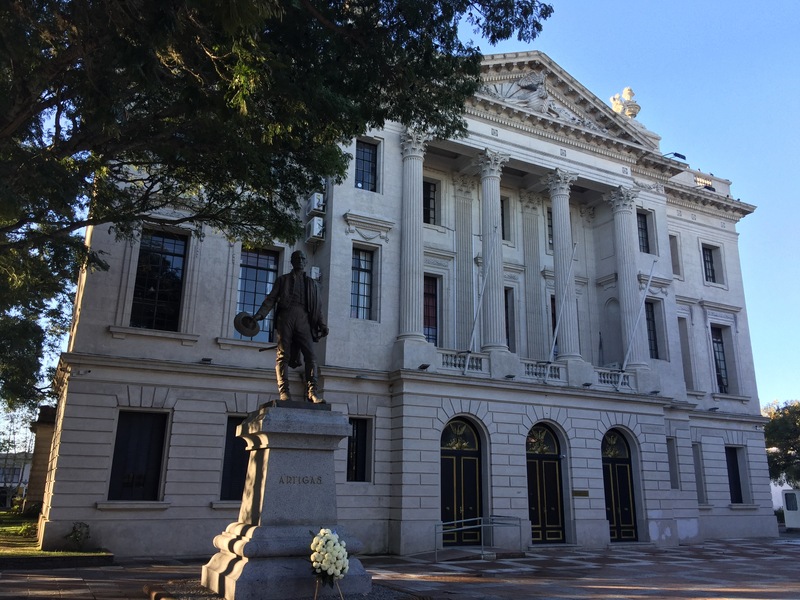 First we visited the near by bus station and booked our bus tickets for the next couple of days to visit Montevideo and Punta de Esta. Then we walked into the old town. Cobbled streets and autumnal trees shedding their leaves greeted us. It was quiet, very quiet being a Sunday and early morning. We first walked to the central church which stood in a quaint square, surrounded by old Portuguese/Spanish buildings. It turned 11 o’clock and the church bells rang out signalling the end of the morning service. We carried on exploring the old town. Next we saw the old city gate, complete with draw bridge and city wall which you were welcome to climb and walk along. Around the corner was the street of ‘sighs’. Why it was named this I don’t know, but it was a popular spot with its original buildings, pretty colours and cobbled stones it made a great picture. Towering above the other buildings was the town lighthouse. It is still in use and open to visitors who want to climb up and get a great view. A crowd had gathered so we opted to do this later. On every street corner were blue and white tiles with the road name. These added a traditional feel to the whole area. Another remarkable thing was the number of ‘old’ cars all over the town; typically 1940s and 50s. After a short walk around town we explored a few more of the cobbled streets and wandered down to the beach. It was now lunch time and we found a nice little restaurant on one of the plazas. We were handed a glass of free champagne when we entered and had a lovely Italian meal with a local white wine. All very delicious and perfect for what we needed. With most people now at lunch we took advantage of the lull and flew the drone from the beach. Taking pictures of the lighthouse and peninsula we were on. Next on the agenda was finding our hotel and checking in. It was located on the main high street and surprisingly had a pool and spa – although we had left most of our luggage back in Buenos Aires, so no swimming costume. Later in the afternoon, after one of our now traditional naps, we explored further up town. The sun had now come out and cleared al the grey cloud of the morning. We visited the craft market and local town hall. We then revisited all of the sights from the morning to take advantage of the better lighting and blue skies. The lighthouse queue had shrunk so we walked up the spiralled stairs to the top level. Mike immediately felt uncomfortable with the height and tiny platform, and low bars. So after a quick snap we descended to the next level were he felt far more comfortable. Here we could walk around with much more room (and less height) and take photos. 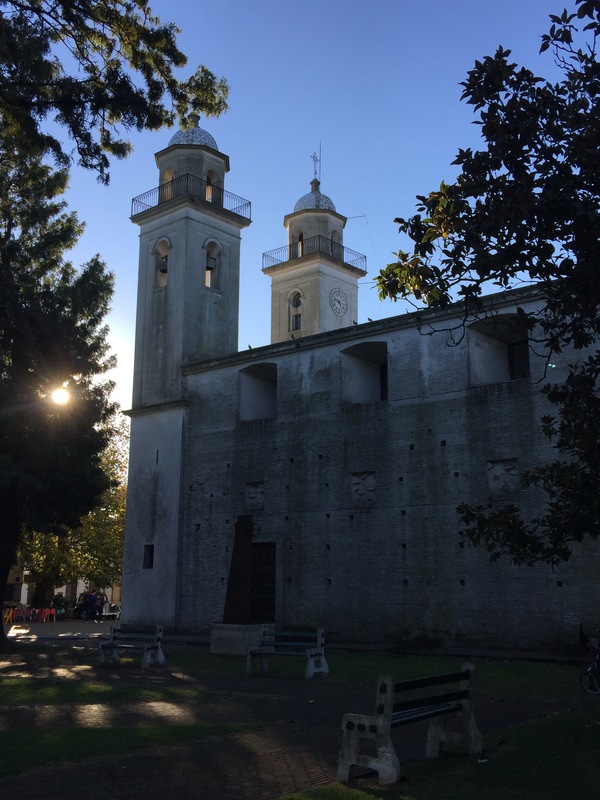 We walked back through the town with the setting sun having throughout enjoyed this little tranquil haven in Uruguay. 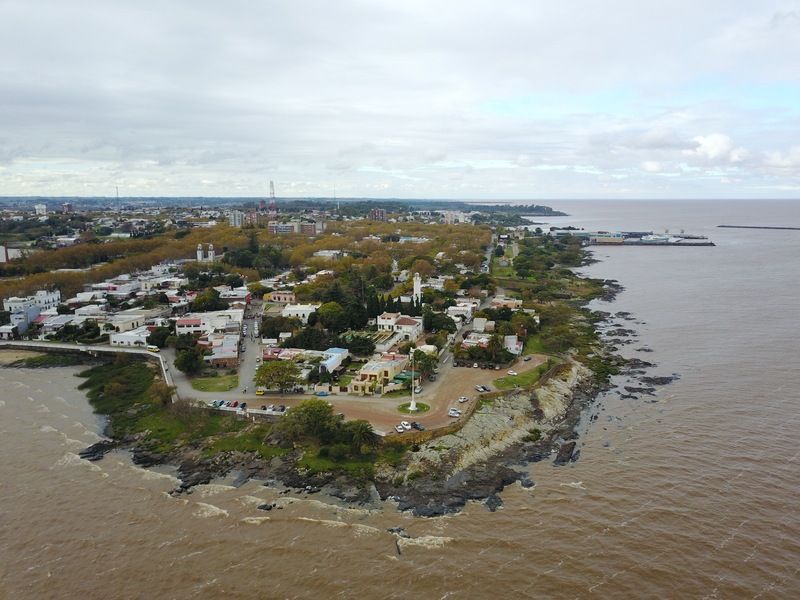 With a large lunch we opted to stay in that evening a prepare for our next leg onto Montevideo- the capital of Uruguay.